Five local people recently completed training and were sworn-in to become volunteer CASA advocates for children in foster care. The Honorable Judge Lauri Blake of the 336th District Court administered the oath to the new volunteers. New child advocates include Ashlyn Hoops, Jackie Schrodel, Rosemary Clemons, Susan Mattison and Richard Mattison. In the year ending August 31, 2018, CASA served 131 children, which set a new record for the number of children served in a year. More volunteers advocates are still needed in order for every child in foster care from Fannin County to have one. Another training class is already being planned for June. All volunteers completed an intensive training class which prepares them to serve as Court Appointed Special Advocates (CASA) for children who have been removed from their home due to abuse and neglect. 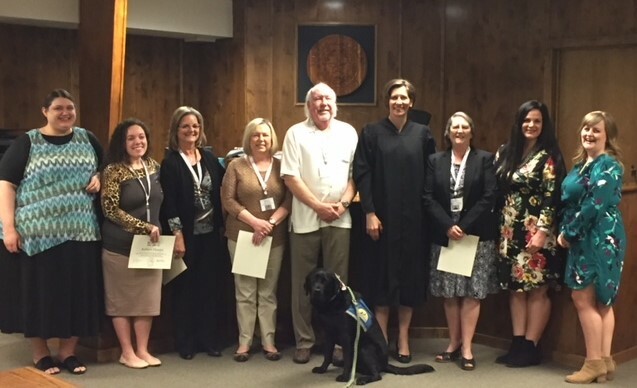 The district judge appoints CASA volunteers to serve as the Guardian ad Litem for each child who has been placed in the state’s custody. In that role, CASA advocates investigate the child’s situation, prepare written reports to the court and advocate for the child’s best interest in court hearings and other settings.